Carlos Torano Exodus 1959 50 Year cigars are unique to say the least. They feature a Brazilian sun-grown wrapper, Honduran binder, and Nicaraguan filler, which come together to produce a complex smoke with notes of chocolate, pepper, and leather with a subtle but distinct black cherry sweetness. A very smooth not too heavy not too light cigar. Always burns perfectly and is very enjoyable. Thanks again for your help over live chat, these were exactly the right ones! Marc loves them, thanks! That are great cigars for the money. Came in a great little box full of flavor. These burn very well with a full flavor. A perfect cigar below $4. Got a full charge of nicotine with this one ! heavy, strong and flavorful smoke. Just bought a box after trying only one. Great price ! 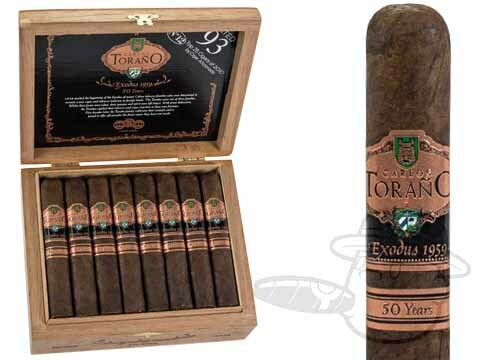 Carlos Torano Exodus 1959 50 Years Box Press is rated 4.5 out of 5 based on 9 customer ratings.